One of the most peaceful sounds in the world is running water. One of the most peaceful places is a beautiful garden. Put water features in your garden to have a wonderful retreat and restful spot. It doesn’t have to be running water. While gardening you can add ponds or birdbaths as well as fountains and other water features. Here are some ideas on types of features and how to include water features in your garden. Fountains can be purchased or you can make them yourself. To include them in your garden, it’s worthwhile to consider several things. * Fountains need a power source, so you’ll need to install your fountain near an outdoor outlet. Or you can go with a solar-powered fountain as long as it’s in a sunny location. * Make sure the fountain is not directly under a tree. Fall-out from evergreens and deciduous trees alike can choke and clog up a fountain. * If you want the fountain to blend in, then consider putting plants in containers around it to make it look integrated. Many gardeners and homeowners fantasize about having a pond and/or waterfall in their yard or garden, but it can seem like a daunting task. It is work – but, depending on how simple or complicated you want things, you can include a lovely pond and waterfall without too much trouble. Here are some tips. * Look for pond kits if you want to do it yourself and you’re not very experienced. These kits come with the basics for setting up, such as a liner and pump, and you provide extras like rocks and plants. * If you like, study the kits and then put together something yourself. It may be cheaper, especially if you already have something you can use on hand (such as a pump or pool liner). * Pile up rocks and hide the pump tubing in among them. Have it exit at the top and you have the beginnings of a waterfall. From birds to bees, birdbaths attract all kinds of thirsty critters. Here are some tips to consider. * Birds do not immerse themselves in water, so keep it shallow – a couple of inches are fine. * Place a rock in the birdbath to give birds something to perch on and other critters something to crawl out onto if they get “stranded” in the middle. All water features need to be cleaned regularly. 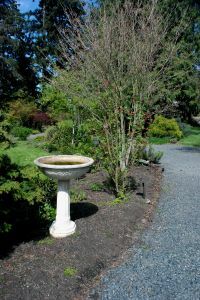 Once a week or so, scrub the birdbath with a stiff brush and fill with fresh water. About every month, it’s a good idea to use a weak bleach solution to scrub the birdbath. Be sure to rinse very well before putting in more water. In the winter, many water features will need to be dismantled and brought inside. Freezing temperatures can break and crack items like pump motors, housing, and hoses. Look at your local garden supply store for special tablets you can float on the surface of your pond to keep out mosquitoes. Water features add beauty, drama, and a sense of peace to flower gardens. They also provide water for wildlife, which you can enjoy observing. Have fun gardening with water!